Of the six Indian seasons - summer, monsoon, autumn, winter, cool season, spring - it is spring when music, dance and love predominate. The raga most closely associated with spring is that of Vasant and, since the major spring festival Holi, 'the festival of colours', is a predominantly Vaishnava festival, the raga is also dedicated to the Vaishnava god, Krishna, whose love adventures are detailed in the 'Gitagovinda'. 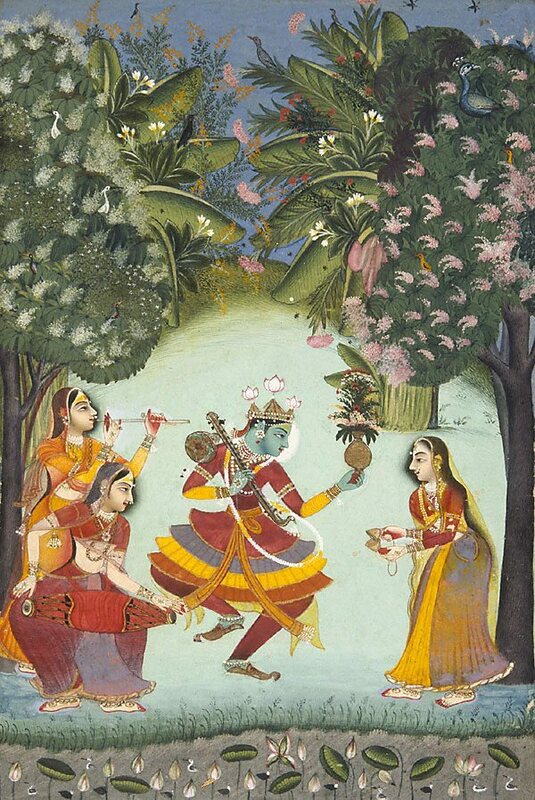 In this vibrantly coloured image, rendered with a fem-cutter's precision, Krishna dances to the music of three young women, by a lotus-filled lake in a glade whose luxuriant foliage symbolises the creativity and fecundity of spring. In one hand he exultantly holds high a vase full of blossoms, while his other hand grasps a stylised vina of one gourd. Krishna wears a distinctive layered dancing skirt, each layer a different colour, tasselled shoes, a jewelled crown, and a long garland of white blossoms, while the body is covered in pearls and jewels. He is the focus of attention for the three ladies: one with an end-blown flute another beating the classical two-faced drum ('mridangam'), while the lady opposite them marks time with 'tala'. This exquisite painting is a folio from a very large set of ragamala pictures that includes representations not only of the six raga and their ragini, but also of numerous sons (ragaputra) and daughters (ragaputri). The series is known as the 'Boston' series since the Museum of Fine Arts in Boston owns some thirteen paintings from the series. The series now is generally credited to Kota, a small Rajput kingdom in southeastern Rajasthan which became a separate kingdom in 1625 when the Mughal emperor Jahangir divided the kingdom of Bundi in half, each half being ruled by related branches of the Hara clan. Jackie Menzies, 'Dancing to the flute: music and dance in Indian art', AGNSW 1997 pg. 286-288. Bruce James, Art Gallery of New South Wales handbook , 'Asian Collection: South Asia', pg. 288-297, Sydney, 1999, 292 (colour illus.). The Asian Collections Art Gallery of New South Wales , 'Mughals and Maharajas: The Miniature Paintings of Courtly India', Sydney, 2003, 42 (colour illus.). Yvonne Tan, Asian Art Newspaper , 'Intimate Encounters, Indian Paintings from Australian Collections', London, Apr 2008, 12 (illus.). Wendy Symonds (Editor), Look , Heidelberg, Jun 1997, cover (colour illus.). The Art Gallery of New South Wales Bulletin , Sydney, May 1997-Jun 1997, cover (colour illus.). The Art Gallery of New South Wales Bulletin , 'Dancing to the Flute Music & Dance in Indian Art', pg. 34, Sydney, Feb 1997-Apr 1997, 34 (colour illus.). Dancing to the flute: music and dance in Indian art , Sydney, 1997, cover (colour illus. ), 181 (colour illus. ), 286, 288. cat.no. 184 See 'Further Information' for text. Pratapaditya Pal, The flute and the brush: Indian paintings from the William Theo Brown and Paul Wonner collection , California, 1976. General reference of other published paintings from the same series. See cat.no. 27. Pratapaditya Pal, The classical tradition in Rajput painting: from the Paul F. Walter Collection , New York, 1976. General reference of other published paintings from the same series. See cat.no. 40. Pratapaditya Pal, Rāgamālā paintings in the Museum of Fine Arts, Boston , Boston, 1967, 11, 12, 34, 47, 51, 58, 60, 62, 68, 70, 71, 73, 87. General reference of other published paintings from the same series. God is a DJ , Australia, 25 Aug 2002, (colour illus.). The Art Gallery of New South Wales - Jul-Dec 1997 Calendar , Sydney, Jul 1997-Dec 1997, colour illus..